Lush Fab Glam Inspired Lifestyle For The Modern Woman: Gift Shopping Made Easy, Fun And Affordable. Gift Shopping Made Easy, Fun And Affordable. We have discovered a fabulous and more importantly budget friendly, wallet friendly and super saver way to get those wonderful items on your wish list and you can do it all all within a few minutes from the comfort of your home computer. So what's this latest find? It's Tophatter an online auction site where you can bid on the items you would like to purchase. It's easy to use and the virtual bidding room which includes a live auctioneer and chat room to communicate with the seller and other bidders makes it a fun and exciting shopping experience. At Tophatter you can find the perfect gift for everyone on your wish list from family to friends to co-workers and peers at a fraction of the normal retail prices. Whether they love designer products like Coach handbags and jewelry or want the latest must-have electronic gadgets like a Tablet. Even the retail store's sale prices won't compare to the steal of a deal you will get from bidding on these items at Tophatter. Still not sure if you should try Tophatter? Then our successful bidding experience should convince you. Our very first try at auctioning and we won the beautiful 10KT white gold sapphire ring shown below. It normally retails for $120 to $170 USD but we placed the high bid and won, paying only $24 for this beautiful gem. Our Tophatter auction win: a 10KT white gold sapphire ring for only $24 USD. A view of the Tophatter virtual auction room during our bidding process. Now don't keep this fabulous online shopping and auction site to yourself, you should try it and recommend it to your family and friends as well. As an icing on the cake we also have a fabulous offer from Tophatter for LushFabGlam readers and fans. Receive a $10 credit when you sign up for Tophatter and spend $11 on an auction. So what are you waiting for? Sign up now and take advantage of the incredible prices, bid on great products and get started! *Tophatter is also available on facebook, click here to visit Tophatter's Facebook Fan Page. 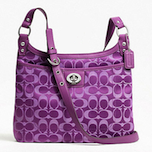 One of the many beautiful designer handbags, this one buy Coach that are available at Tophatter. (Photo by Eclipse Designs on Tophatter). Have you discovered the addictive new auction site called Tophatter, where buyers bid for sellers' unique goods in fast-paced virtual auction rooms? From crafts and DIY projects, to antiques, jewelry, home décor and much more, there’s no limit to what you can discover on Tophatter. 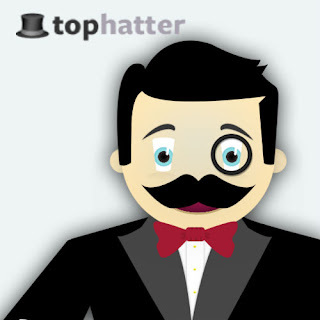 Tophatter's auctions become interactive live events where buyers and sellers can hang out, chat, and win. Led by the esteemed Sir Wendell Wattington and his animated family, Tophatter auctions keep the fun rolling in.